Jenni Brant is originally from southwest Wisconsin. Growing up in handmade clothes and having a father that was a farmer by day and a woodworker by night, she knew that her life would revolve around the visual arts and craft. In 2007, she received an MFA from the University of Nebraska-Lincoln and holds a BFA from the University of Wisconsin-Whitewater. Brant splits her time between being the Education Director at Lux Center for the Arts in Lincoln, NE and working as a studio artist, creating functional pottery that she sells and exhibits nationally. 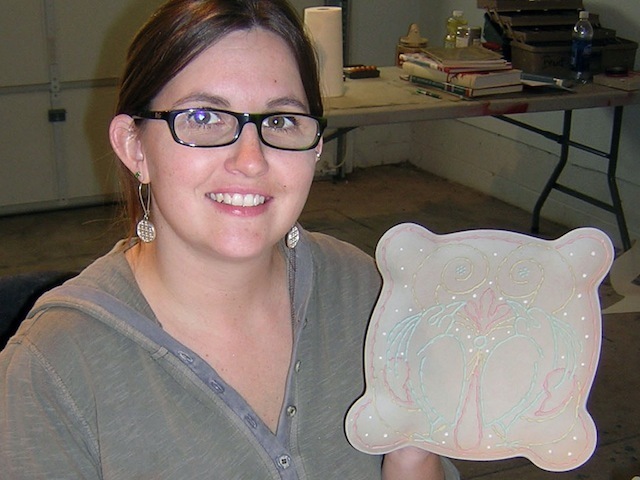 She was recognized by Ceramics Monthly as an Emerging Artist and was a Niche Award finalist in 2008. Brant recently received the 2009 Kimmel Foundation Mayor's Arts Award as an emerging visual artist through the Lincoln Arts Council. My favorite aspect of the residency was the undistracted, solitary time to work! My studio (#2) was wonderful with both the natural and track lighting and the garage door. There's so much I like! I like the intimate nature of the residency and how the very excellent alone time is balanced with just a bit of togetherness with the organized lunch and invites to some stuff in town. I love the Third Thursday open house. I thought the number of residents was perfect. It was easy to get to know everyone, and feel comfortable here. Both my living and studio accommodations were very comfortable and welcoming. The Staff was very supportive, it was easy to reach out and discuss anything. The facilities are also very comfortable, and the environment is great for working. The open gallery night was especially wonderful. I really enjoyed the chance to share my work with the larger community and to hear their feedback and questions — as well as to see and hear the work of the other residents. For me, the most valuable aspect was the open structure that allowed for plenty of time and space to make work, make friends, think, read, write and be. The apartment was beautiful, comfortable and inspiring. With the studio only a few steps away, it was easy to be productive. This place is shockingly quiet. The welcome letter mentions that, but it's nothing compared to the actual silence on the grounds. The town itself aids to this, and it yields an excellent environment for creativity. The interdisciplinary structure is really beneficial and generates unique conversations while providing mutual inspiration for residents. The staff is engaged but is also very conscious of respecting the time and space of each resident. Nebraska City has excellent institutions but still provides a quiet and slow-paced setting. The apartment and studio are well equipped, clean, and well maintained. Facilities, staff, and the ease with which I was able to simply settle in and work all exceeded my expectations! I think the facility at KHN could not be more ideally suited for an artist residency program. I felt like I was staying in a very comfortable private home and I had everything that I needed to do my work, and having the private bathroom and spacious kitchen was wonderful. Peace and quiet. Beautiful facilities! Piano was great, staff was very friendly and helpful. And that Mexican place is EXCELLENT. KHN is a wonderful facility in a beautiful space. It was great to have time to focus on my work, and I took advantage of the location to photograph several nearby prairies and natural areas. The staff was so helpful and accommodating. I couldn't believe how easy they made everything. They also were always ready to find things for me and share resources. This made everything so much easier since I had travelled from too far to bring a lot of extra items for my studio practice. I loved that there was a mix of writers, artists and composers. This mix made for great conversations and interesting meetings. The space and set up were great! This is one of my favorite residencies thus far. The location of the apartment wasn't too far from civilization but also in a good area for it not to be super noisy nor was there lots of traffic or other sounds. The middle school across the street wasn't at all a distraction. I also really loved the dessert spots and greatly appreciated the staff's flexibility and availability to help, answer questions, drive you to the store when needed. All the details were thought of right down to a bathroom mat and miscellaneous supplies available in its own closet. This was the first time I'd ever had my own living space and studio, and time to structure as I pleased, so everything was a revelation to me. The pace of Nebraska City was a welcome shift from New York and I found it to be very welcoming without being intrusive (and just pedestrian-friendly enough). I absolutely loved how carefully considered every detail of this residency is. The building itself is just a marvelous organization of rooms, I could be alone or together with other residents whenever I needed. I love my room, I love my studio, I love that the town is calm and peaceful and pretty. It's so relaxing here. No one bothers me, and I feel free. This has been such an incredible opportunity for me to have the space and time I needed to really develop my artwork. The facilities at KHN are wonderful; I appreciated the garage had tons of wall space, natural light, and was temperature controlled. It made it incredibly easy to just jump right into the work. There is such peace and quiet in a shared home and town is lovely and very conducive to working. The planned trips the store are so helpful as well as transport to/from the airport! I really love the combination of autonomy and support here--I can be self-directed, but there is so much warmth and community as well. The staff is welcoming and communicative, and the facility feels very much like home. I love the combination of solitude and camaraderie...getting an extended period of time to do nothing but work on my fiction is a rare and much-appreciated gift, but I also love meeting the other residents and learning from them. The time and space away from my daily routine, jobs, relationships and responsibilities allowed me solitude and focus. The residency provided an opportunity to work in an environment of serious, like-minded artists and writers, which has pushed my practice and provided a platform to build a new body of work. It was a great experience. I was able to produce more in my 3 week residency than I can normally in half a year. The building itself was inspiration for me and I enjoyed the small number of artists present at one time. The staff was incredibly helpful with their time, resources and ideas. The residency was flawless in all areas. Facilities were charming and clean, the program structure open-ended, staff talented and kind, Nebraska City vibrant and idiosyncratic. I truly cannot single out any particular facet, as all aspects complemented the others: the architecture promotes seclusion and community, the structure promotes exploration and collaboration, the staff promotes well-being and cohesiveness, and the town promotes discovery in digestible pieces. Perfecto!